For gardeners, the colder months seem to last forever as they anticipate spring days spent outdoors cultivating colorful blooms. But according to garden expert John Floyd, year-round gratification is attainable. There’s one word that seems to perfectly sum up winter weather in the South—unpredictable. One day the temperatures may dip below freezing, and the next day we find ourselves wearing short sleeves and possibly even shorts. And thanks to those warmer days, our gardens can come alive with fragrance and blooms in beautiful shades of white and yellow that brighten our spirits in the midst of an otherwise dreary season. As I walk through my own winter garden, I especially enjoy the fragrance of winter honeysuckle. This old-fashioned, semi-evergreen large shrub covers itself with tiny, clear-white blooms that cling tightly to the stems and fill the air with a sweet scent. Nearby, the bright white stems of baby’s breath spirea help erase the gloom of a gray day. 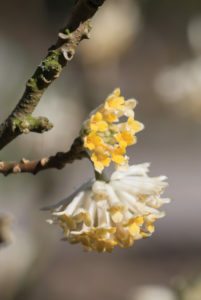 But perhaps the showiest whites on warm winter afternoons are white empress camellia and paper bush (also known by its scientific name, Edgeworthia). 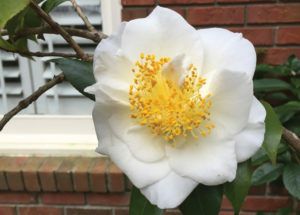 While most gardeners are familiar with the pinkish red empress camellia (also known as Lady Clare), the lesser known white selection offers a beauty all its own that shows itself in a few select blooms during warm winter periods. And paper bush continues the off-season spectacle with its nodding flowers that adorn the deciduous stems and emit a strong fragrance more enjoyable from a distance than close up. While this plant may not be as common as the camellia, it’s an easy one to grow if you know a couple of tips. Paper bush likes semi-shade and year-round, fertile, moist soil. I learned that the hard way when I lost half of mine several years ago after leaving the sprinkler system off in summer while out of town. Certain yellow flowering plants also hit their stride in the winter months, and two of my favorites are popular in many Birmingham gardens. Winter jasmine, with its green-stemmed arching shrub, is often mistaken for forsythia when in bloom but is actually quite different except for its yellow flowers. Often seen dripping over walls, this plant will keep its arching habit of growth even if not planted above a wall. I have a mass of winter jasmine that is about 20 years old and is about 4 feet in height, but it can be kept much smaller if pruned. My other favorite is the leatherleaf mahonia that displays a whorl of flowers in mild winter periods. Make sure that you give this plant a semi-shaded or shaded location to keep its leaves from scorching. Such small efforts will reward you with winter fragrance and color for years to come. Bring it indoors: Forcing branches of quince, forsythia, and star magnolia (above) can add a spot of color to the indoors this winter. Cut the buds when swollen and showing a bit of color. Once cut, place the branches in lukewarm water in a warm room, and they should show color in a few days. Remove the last fallen leaves from the beds, and add a light coating of new mulch. Be sure to cut your dormant turf with a bagging mower to get the last bit of refuse and dead grass clippings off of your grass. Look on the underside of your camellia leaves, including sasanquas, to see if a white fuzzy material is present. If it is, you have camellia tea scale. Spraying with horticultural oil is a common method of control, but there also are some excellent chemical applications you can apply to the soil. I have had a lot of success by applying Bayer Advanced Tree & Shrub Insect Control around the plants according to label directions. When digging up the plant, try to get a root and dirt ball at least as big as the canopy’s diameter. 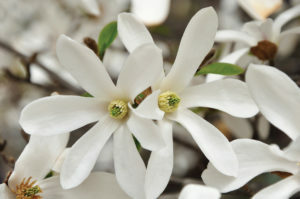 If that is impossible, reduce the size of the plant to equal the root ball’s diameter by taking out selected branches. If you are wanting to grow vegetables, now is the time to prepare your soil. Choose a small area in your yard that is currently empty. I like to turn the soil the old-fashioned way with a spade or turning fork. Add organic matter, if desired, and then cover the area with clear plastic. Now you will be ready for planting in late winter or early spring with no weeds to worry about. John Floyd has been gardening in the Birmingham area for more than 30 years. In addition to his day-to-day experience, John has degrees in horticulture from Auburn and Clemson Universities and was Editor-in-Chief of Southern Living.